Hot tubs come in many different styles, which means you have a lot of options when it comes to your home spa. From inflatable hot tubs to professionally installed models, you’ll be able to customize your design. Most people will get a large sized hot tub, but 2 person hot tubs are great if you’re just spending time with a partner. 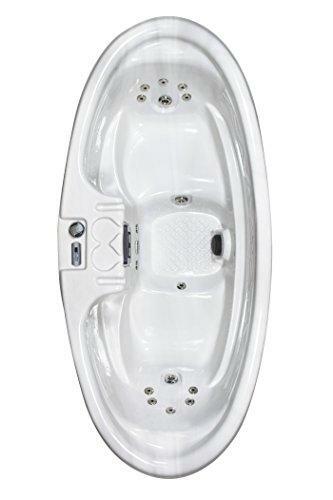 Two person hot tubs come in a variety of styles and have many different color and shape options available. They are convenient and can be easily used to provide a relaxing and intimate space. However, a quality 2 person hot tub can be hard to find. There are a lot of cheap designs that aren’t built to high-quality standards. Our guide is designed to help you find the best 2 person hot tub that you’ll love to use week after week. Below we have some important features to consider, as well as a list of the eight best 2 person hot tubs. The AirJet system is a popular choice for inflatable hot tubs and Bestway has perfectly incorporated it into their SaluSpa Siena 2 Person Hot Tub Design. This hot tub uses the AirJet system to soothe your stressful days. It is also a full package, which includes everything you need to maintain and operate your hot tub. It also has a removeable table, so that you can keep you drinks handy. If inflatable isn’t your style, this hard sided 2 Person Triangle Spa is an excellent choice for having a permanent hot tub in your home. This design uses a strong pump to provide power to 28 stainless steel massage jets. With American Spas’ design, you’ll have a 5-star hydrotherapy experience for two. This 2 person spa is also great because it has an effective titanium heater, which is whisper quiet and quickly heats at the push of a button. A HydroClear Ozonator purifies your water to keep it clean and sanitized. For a unique shape, this Oveal 2-Person Spa is an excellent choice for a luxurious home spa treatment. It is a hard-sided design, which has 16 stainless steel jets to massage away the pain. There are built-in seats for comfort and a strong heater ensures you’re never shivering or cold. With QCA Spas’ design, all you have to do is Plug and Play to get your spa experience started. 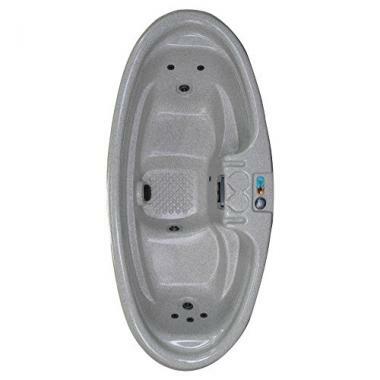 Essential Products’ 24 Jet Hot Tub is durable, stylish, and easy to maintain. This hot tub has 24 stainless steel jets that can provide a much-needed relaxation break for 2-3 people. It has built-in seating to ensures everyone is comfortable and has their own space to relax. It has a smart design where no electrical connections are required with a GFCI cord. It also comes with an insulated cover with locking clips to ensure maintenance is a breeze. QCA Spas makes our list again because of their great hot tub designs. The Gemini Plug and Play Hot Tub is another one of their top rated two person hot tub models because it has a two stage heating system and is energy-efficient. This hot tub can easily be plugged in started and runs off just 120 volts. It uses a frictional water pump heating system and a heat recovery system to maintain the perfect temperature for a muscle relieving soak. If you love the oval shape, but want the convenience of an inflatable design, look no further. 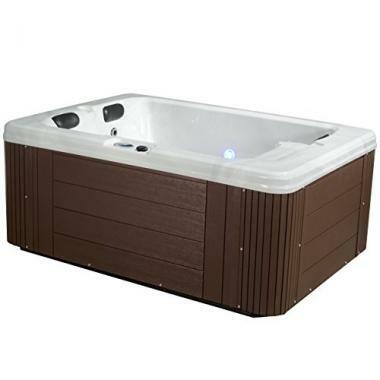 ALEKO offers a top rated 2 person hot tub that can be easily moved around the home. It holds 145 gallons of water and is perfect for joint and muscular pain. It will easily heat your water up to 108 degrees for a great spa experience. It is a durable design and has built-in features like a fitted cover. If you love waterfalls, look no further. Aqua Rest offers a great design that has a relaxing cascading waterfall that is backlit in 8 multicolor LEDS to set the mood. This 2 Perosn Waterfall Spa is a great choice for the home because it offers barrier-free seating, so you can get cozy. It has 14 stainless steel jets for a strong hydrotherapy massage. To top off our list, Aqua Spas takes the spot again with their very popular 2 Person Spa with Waterfall design. This model is a top choice because it offers a unique waterfall that gently cascades and is highlighted by 9 multicolored LED lights. It is easy to use with the Plug and Play design, which means you won’t be frustrated with the setup process. It also has barrier-free seating, which makes it extremely comfortable for two people to use together. Out of all the home spa products that are available on the market, 2 person hot tubs are becoming a popular addition to the home because they are convenient, the perfect sized, and durable. Yet with all the models available, you are faced with an overwhelming choice. Here are some features that will help you determine what makes a top rated two person hot tub. These tips will help make the buying process effortless and frustration free, so that you can get to your relaxation time faster. The size and dimensions of a hot tub for two is important based on where to put your hot tub. If you want to put your 2 person spa in a small area, you still want to be certain that your design will adequately fit the space. You can’t cram a hot tub for 2 people into a space too little because it could actually cause a lot of damage to your home. To ensure you don’t ever run into a problem, check the size and dimensions of both your desired hot tub model and the area you intend to use it. You’ll also want to be certain that there’s enough room for you to work on the installation and setup of your hot tub too. Hot tub 2 person designs will fit, as the title says, two people and that is usually the maximum capacity. The best 2 person hot tub will have enough room that is spacious for two people to comfortably stretch out. But you don’t always have to use a hot tub for two with the full capacity. If you just like a little more room than normal, a 2 person jacuzzi can give you all the private space you need to fully stretch out. However, if you’re worried about feeling cramped in a 2 person inflatable hot tub, it would be best to consider other designs like Intex hot tubs, which would offer larger capacities. The heating system is where it can get very tricky. There are many hot tub 2 person designs that have inadequate heating systems that won’t be able to heat the water in a reasonable amount of time or keep it hot. An ineffective water heater is a big frustration and it can end up wasting a lot of energy. 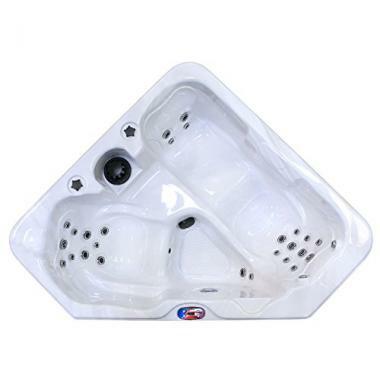 Therefore, it is important that you find a top rated two person hot tub that comes with a functioning heating system. You can check 2 person hot tub reviews to see what others have said about a specific design, which will often help you determine if the heating system functions or not. Everyone loves jets and they are a key feature for a 2 person jacuzzi. 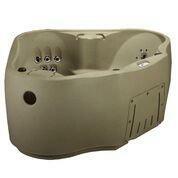 The best 2 person hot tub will have jets for each occupant that are perfectly placed to give a luxurious massage. Again, you can check 2 person hot tub reviews to see what others have thought about the power, strength, and position of the jets. But you will also have to consider what type of jets you want. There are AirJets, Hydro Jets, and bubblers. Not all are the same and not all cost the same. Bubblers are the least expensive, by Hydro Jets are the most and offer the best spa experience. Maintenance is an important part of owning any hot tub, if you want it to be long-lasting. But you’ll also have to keep a clean 2 person spa to ensure the water is sanitary and hygienic. There are a lot of hot tub chemicals or hot tub defoamers that can help you maintain your water. But ideally, you may also want to invest in hot tub covers to help make maintenance easier. Q: What is the difference between a hard-shell and inflatable hot tub? A: The difference will be in the walls. A hard-shell hot tub will have hard sided walls that support the water inside. They will not need to be inflated to setup and will likely have extra features like built-in seating. Hard-shell hot tubs can also be placed in colder locations and may be more durable for outdoor use. A 2 person inflatable hot tub will have soft sided walls that need to be pumped with air to build the structure. 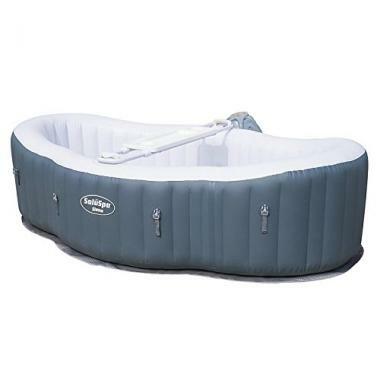 An inflatable hot tub will be easier to move, as well as simple to deflate and store. They will have a strong material that is resistant to tears or punctures to ensure all your water stays inside. Q: What are the pros and cons of an inflatable hot tub? 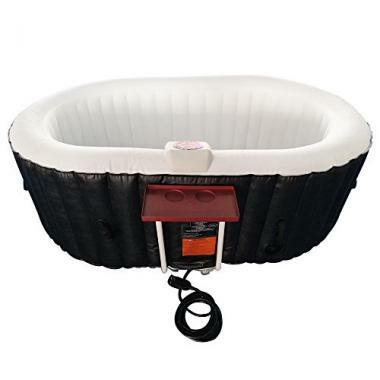 A: A 2 person inflatable hot tub is great because it can be easily moved around the home. They have a lightweight design and the ability to easily deflate and collapse down. This will also allow you to easily store the hot tub when it is not in use. The inflatable walls make for a cushion-like feel that is soft, but sturdy. However, most 2 person inflatable hot tubs will lack built-in seating and won’t have a strong heating system. They may also lack specific features like jets, waterfalls, or lights. They also cannot be used in outside temperatures that are lower than 40 degrees Fahrenheit. Q: What are the pros and cons of a regular hot tub? A: Regular hot tubs are popular for people who want to fit a large capacity, like 6 or more people. They are will likely have built-in seating for comfort and can come packed with features. There are designs which have jets, bubblers, lights, and waterfalls available. The downside is that they are harder and more expensive to install because they are heavy and will need a team lift to move it into place. Once it is in place, you likely won’t want to move it either, which means you lose the ability to change its position around your home. They can also be difficult to bring inside, unlike inflatable designs, which means you are more limited with the areas that you can place them. A top rated two person hot tub will always be a popular choice in the home spa products. A two person hot tub offers affordable and attainable relaxation for the home with durability, versatility, and function. With the best 2 person hot tub, you will be able to soak after a long day hiking or a stressful day at the office. Do you own one of the 2 person hot tubs that made it onto our list? Let us know how it has worked for your home spa treatments in the comments section below.